Many people know the misery that heavy snoring can cause. Trying to get a good sleep can be difficult for both you and anyone sharing the room with you. Fortunately, there are numerous products available to help reduce snoring. These products are all designed to aid breathing or adjust positioning during the night. In theory, users should notice a reduction in snoring levels. One popular option is the anti-snoring pillow. 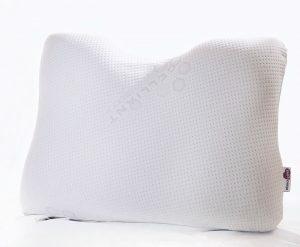 A Turkish company, Visco LOVE US LLC makes a product called the Celliant Orthopedic Wellness anti-snore memory foam pillow. Established in 1996, this Turkish manufacturer offers access to a range of sleep products including matresses, pillows, and medical products. The company quickly established a chain of 150 showrooms and 250 points of sale in Turkey. In 2008, Visco began expanding internationally and its products are now sold in 40 countries throughout the world. The company was the first visco, a type of elastic, producer in Turkey and the only molded visco producer in the country. Visco products fall into two general categories: pillows and mattresses. The only have two mattress offerings currently but according to the Visco website, the company will be expanding the line with more than a dozen offerings in the near future. Visco sells several types of pillows, advertised for certain specific market sectors. For example, Visco manufactures a popular line of travel pillows and have a pregnancy and baby pillow line also. Each Celliant has a different shape depending on your particular sleeping style. The company also sells another popular model called the Duofit Super Soft Pillow. Visco’s products, including its anti-snoring pillow at two for $54.99, are sold on Amazon as well as directly through its website. The prices appear to be about the same from either source. What do anti-snoring pillows do? The purpose of an anti-snoring pillow is to provide support and help to adjust your sleep posture and focus on correcting the natural alignment of your head and neck. This posture change can help to open the airways, which enables you to breathe properly when sleeping. Snoring should be alleviated and results in a good night’s sleep which is important for your health and overall well-being. This change does depend on the effectiveness of the pillow and how suited it is to your specific needs. The manufacturer claims the pillow adjusts sleep posture, which in turn should reduce snoring through the night. It is also designed to provide support and ease the pain caused by dental surgeries as well as shoulder pains. This pillow is meant to provide enhanced support for the neck and shoulder compared to standard pillows. 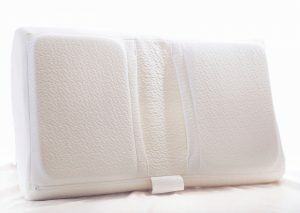 It is a hypoallergenic memory foam pillow that moves in line with heat and pressure. It comes with a removable zip cover for easy washing. After reading about this anti-snore pillow, I decided it was worth trying to see whether it helped with my snoring. The product was competitively priced, and upon receipt, I simply opened the package, slipped on a pillow case, and gave it a try. On the first night, it felt as though I was using a standard memory foam pillow. It was comfortable but I didn’t notice anything different compared to other standard memory foam pillows I’d used in the past. When rested my head on the pillow, no tilt or support indicated it would help reduce my snoring. I went to sleep easily, and I had a good night’s sleep without waking up. I tend to sleep in a range of positions over the course of the night, and determined this pillow is excellent for those who sleep on their stomachs. It is also useful for people who put their arm under the pillow when they sleep. I did notice my head ended up in a variety of positions on the pillow during the night. At times, it would be on the side while on other occasions the pillow would be right down by my neck. I was, therefore, unable to rest my head solely in the anti-snore zone of the pillow. In the morning, I used my SnoreLab app to check whether there had been any noticeable difference in my snoring levels. Unfortunately, the results showed there was no significant reduction in either snoring quantity or volume. I used it for several nights, but experienced the same results: The Celliant Orthopedic Wellness had no positive impact on my snoring. It is made from nice memory foam. You can easily sleep in different positions. The pillow is very comfortable. You can fold the pillow to prop your head up for reading or watching TV. I fell asleep with no problem and got a good night’s rest when I used it. There is not much head tilt to provide support and aid snoring. The memory foam is quite soft, which means there is not much support. It had no positive impact on my snoring. If you move around during the night, your head moves away from the anti-snore zone. If you are looking for a decent memory foam pillow with minimal support, this is an affordable option. If you move around a lot during the night, your head won’t remain in the anti-snore zone of the pillow. Given that you would have to sleep in the same position all night without moving your head, I don’t believe this is a very effective anti-snoring aid. Although the comfort levels were fine and the pillow feels nice, I bought the pillow with the expectation that it would help reduce my snoring. Unfortunately, there was no improvement in either the volume or level of my snoring.